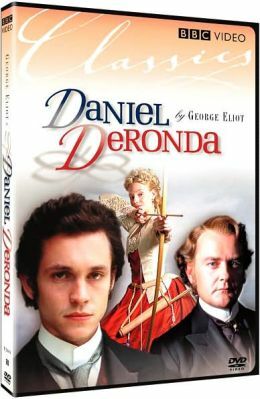 Produced for British television, Daniel Deronda was adapted from George Eliot's final novel, written in 1874 and first filmed in 1921. As was her habit, Eliot laid bare the hypocrisy and venality of Victorian-era "class culture," at the same time admitting that a certain amount of conformity was necessary if one hoped to survive in a world where nonconformity was not only looked down upon but actively suppressed. Essentially, both the novel and the TV presentation are comprised of two separate stories, linked together by the titular Daniel Deronda Hugh Dancy, a young man of Jewish heritage. In the main narrative, Daniel is attracted to the spoiled, headstrong Gwendolen Harleth Romola Garai, who is reluctantly poised to enter into a marriage of convenience with the wealthy, snobbish, and intensely anti-Semitic Henleigh Grancourt Hugh Bonneville. This romantic intrigue is played against the curious relationship between Daniel and the Zionist visionary Mordecai Daniel Evans, who tirelessly proselytizes in favor of a permanent homeland for the Jewish people. Things come to a head when Daniel finds himself falling in love with Mordecai's sister Mirah Jodhi May. Originally telecast in three parts on the BBC beginning December 7, 2002, Daniel Deronda was re-edited as a two-parter for the PBS anthology Masterpiece Theatre, where it first aired on March 30, 2003. In a small recognition of Passover, I wanted to bring this review of the wonderful BBC presentation of George Eliot's "Daniel Deronda." What a great book it is and the BBC did a fine job of recreating it to the screen. Actors in this show are just hand-picked to be beautiful, it seems! They are studied and good in their parts...very believable and earnest, as well. I loved Daniel from the first glance. Isn't he gorgeous!? No wonder the leading ladies fell in love with him. I did. I thought he gave a flawless performance. I loved watching this show and was just captivated by the story and the actors. Highly recommended for any time of the year! Have you seen any good ones lately you can recommend?